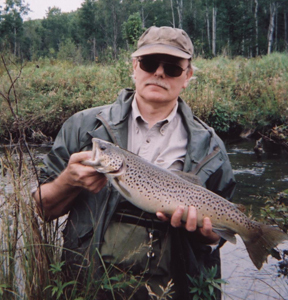 I was thinking back fondly on a strange incident at Tin Bridge on the Pigeon River in the Pigeon River State Game Area. I had parked my 10 year old 91 Pathfinder at the bridge and fished a stretch upstream and when I returned to my vehicle I had to drive over the bridge, turnaround, and re-cross the bridge to head back to camp. At that time the bridge was in pretty rough shape with squared off logs laid sideways and apparently not firmly attached. You could hear a distinct thumping sound as you crossed but what was really happening down there was not clear. As I re-crossed the bridge the dull thump sound was replaced by my blasting exhaust. A log had somehow knocked my muffler off – but that was small potatoes. When I put on the brakes my foot went to the floor. I rolled to a stop and looked underneath. I could see a severed brake line with dripping fluid and the muffler hanging low. There was nothing I could do but glide back to camp. Fortunately it was all two-tracks and I didn’t meet anyone head-on. Back at camp my buddies took turns surveying the underside and that’s where we first noticed the frame damage. The rear axle on a 91 Pathfinder has support members designed for stabilizing. One was definitely broken. The frame was fairly rusted out anyway so it was hard to gauge how much I can blame on the bridge. Still, this was serious. The frame needed work. I started adding up the costs. We were out in the sticks and the closest town with any auto service was Gaylord, at least twenty miles away. It would be expensive to have the vehicle towed. The exhaust and brake line might run a couple hundred bucks. The frame was the wild card – I didn’t know if I could even get the frame fixed, or for what cost. I fired up the Pathfinder the next morning and found that a car without exhaust is twice as noisy on a cold morning. Feral followed me in, wisely, since he didn’t want to provide brakes with the rear of his vehicle. We took the old highway into Gaylord to avoid traffic. I used my parking brake lever to help stop – I can’t remember if I had a hint of brake left – that may have been the case. I think we pinched the severed line so the brake system held some pressure. I rolled into a muffler shop near Main Street and they put it on the hoist. They did right by me – putting on a cheap muffler and fixing the brake line. They also directed me to a place that might be able to fix the frame, a welding shop of some kind. As I recall, they were closed. It was Saturday. Meanwhile I had to formulate a back-up plan: just in case. I could scrap the vehicle or try to trade it in for something else providing a dealer would even take it. We did a little car browsing and I was feeling the pressure. I really needed the frame fixed in order to avoid a “make-do” car buying experience. Being at the mercy of a car salesman is low on my list of entertainment. I looked at a few older vehicles but didn’t see anything I would even want to consider. On Monday Feral and I stopped at the suggested welding shop and explained the situation. The young fellow working there (alone) crawled under the Pathfinder and banged on the remaining rusted frame to see what he could find to work with. He offered to weld some new pieces of steel onto the frame for $200. I jumped at it. He told us to come back at the end of the day. When we arrived later I could tell he spent more time than he planned but he was very professional about it. I looked underneath and could see he’d welded some new steel in place and listened as he explained the difficulty of making sure everything was aligned properly. By all accounts I had lucked on a perfectionist who took pride in his work. Bottom line: I was back in business for about $350 total car repair. If nothing else, this is a true story about nice people in a small town helping out a guy with car problems. It could have been a disaster. I should mention the state has replaced the old bridge. The new one is an eye sore with heavy duty guard rails that belong on an expressway – not exactly what you want to see on a two-track out in God’s country… but I really shouldn’t complain. If anyone has a photo of the old bridge please send it to me and I’ll add it to this post. Thanks. Everything I know about quicksand I learned from Tarzan movies. The main thing to know is: bad guys don’t make it out, but good guys and gals always do. If you’re a bad guy, please stop reading. Quicksand on a trout stream is a little different than sand bogs in Africa, but there’s some similarity. They are both camouflaged so you don’t see it until it’s too late and if you make it out alive you’ll have an interesting story to tell even if no one believes you. Quicksand on a trout stream is harder to see since it’s underwater. The stream bottom appears normal except there is no visible hole (sand covers it) so you don’t know it’s here until you start sinking. In waders it’s pretty scary since swimming doesn’t feel like an option. I’ve found quicksand on the Pine River in Lake County and the Sturgeon River in the Pigeon River State Game Area. On the Pine, the particular spot I know of is a few bends downstream from Raymond Road. The first time I ran into it I was alone. I scrambled to get out and it was like running in place up a sand dune. It was easy to see the exact spot afterwards because a cloud of light gray silt poured out like smoke. An hour later, walking the bank downstream, the silt was still pouring out. A couple years later I fished the same stretch with Feral Tweed and mentioned it to him right before we got there (it was hard to forget). I was in the lead and sure enough I stepped into it and the same thing happened. Here again, I didn’t see the hole – it looked just like the rest of the sandy stream bottom. A film of sand over the hole made it invisible. The Sturgeon River has at least one spot I know of in the section they call the Valley which is upstream of the notorious Ford property. The same thing happens, but without the silt pouring out. How dangerous it is I don’t know. You start sinking and your reactions take over. This spot is near the left bank (fishing upstream) opposite and below a couple giant evergreen trees that lean out over the water from right the bank. If the stream is low it’s easy enough to wade around (since I know the exact spot), but with high water I get out on the bank and get back in above it. How prevalent and dangerous are these quicksand spots? If you are careful wading, meaning testing each step which you should be doing anyway, then you will likely get off with a small adrenaline rush and some exercise. Best not count on Tarzan to rescue you. He’s busy.